Another fun One Yard Wonder! 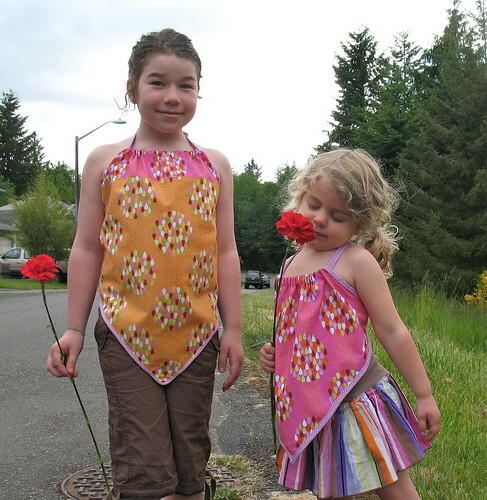 Those of us living here in the beautiful but rainy Northwest never noticed the irony in sewing summer halter tops from raindrop fabric, but Rebecca pointed it out in her Monday blog comment! This pattern was super quick and easy. Tracy made it a little more challenging for herself by not thinking about the print being directional. A half yard of each wasn’t quite enough. (It would be plenty if the fabric wasn’t directional). She elongated the square to give a little less sharp a point in front, and a little more coverage on the sides and in the back. Instead of finishing the edges of the squares in one of the several ways suggested by the designer (so nice to be given options) Tracy used bias tape cut from the tiny gingham. A wider bias binding for the neck tie instead of ribbon. 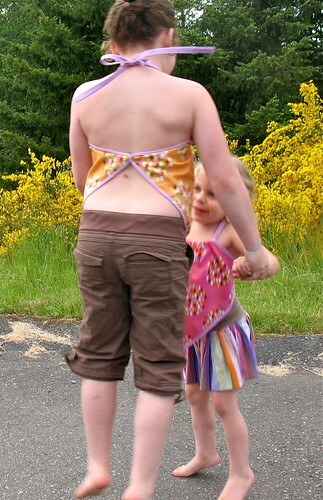 Adding ties to the back of the Halter tops would be a good idea. There was not enough fabric to tie in a knot. The top for the 3 year old is a 14″ square, and for the 8 year old, 18 inches. 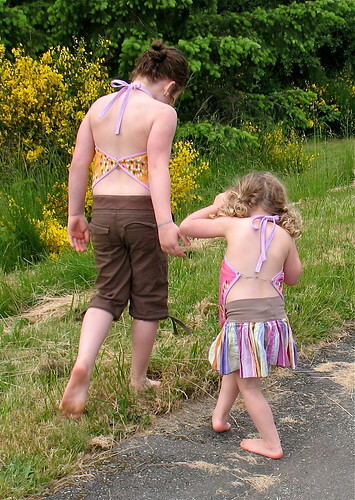 These tops could be made in a dressier voile, and they could easily be lined. The dress turned out darling but too big for Sarah. The scale of the fabric was a good choice for a petite young woman. Step 1, Determining the Size, was a bit tricky for Carrie due to little experience with sewing clothes. (the bias skirt from week 21 was her first clothing item). Her daughter’s measurements fell at the top of the small category and bottom of the medium. Carrie chose to make the medium pattern not wanting the dress to be too small. The sundress was too big. After discussing the process with the more experienced sewers in the shop Carrie learned bra size does not = bust size. Kathy suggests taking a “high bust” measurement. The actual construction of the dress went together pretty well. Carrie wished she had a serger to make the seams more neat and tidy. She did zigzag the raw edges to help keep them from unraveling. The elastic was to be 2″ shorter than rib circumference just under the bust. Next time she would tighten up the elastic more than 2″. The length on the dress was good for the 5′ 2″ recipient. Cutting the fabric. The fabric is folded with the selvage edge together. After washing the quilting cotton Carrie was only able to get 20 3/4″ width for the skirt front and back. The size large would not work with the width of fabric she had. Quilting cotton is typically 42/44″ after being washed, the fabric was just shy of 42″. Carrie created a narrow bias binding using a 12mm (1/2″) bias tape maker. This was a nice width for the dress and comfortable for the ties. An order has been placed for the same fabric so Carrie can remake the dress in size small for her daughter. A grateful friend will receive the medium!